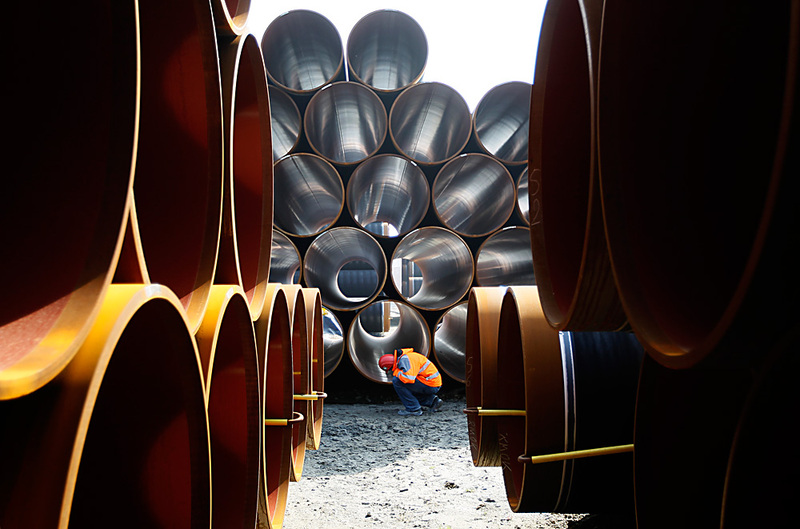 A worker inspects pipes for the Nord Stream pipeline at a storage facility in Mukran on the Baltic sea island of Ruegen April 8, 2010. The board of directors of Russia’s biggest gas producer Gazprom has approved the termination of the shareholder agreement of Nord Stream 2 AG, the operator of the Nord Stream 2 gas pipeline, the company reported on Nov. 11. The decision was taken unanimously at the board of directors meeting on Nov. 9, Gazprom said. The Swiss-based Nord Stream 2 AG was set up for the design, construction and further exploitation of the Nord Stream 2 natural gas pipeline. Earlier Gazprom and its European partners (Engie, OMV, Shell, Uniper and Wintershall) applied to German and Polish antimonopoly regulators on setting up a joint venture for the implementation of the Nord Stream 2 project. Germany approved the decision while the Polish regulator raised objections, saying that such a JV would restrain competition. Later the companies recalled the application to the Polish regulator. Gazprom’s head Alexey Miller told to TASS that the participants of the project planned to define a new pattern of the project’s financing by the end of this year. As of now the pipeline’s operator is wholly owned by Gazprom. The Nord Stream 2 natural gas pipeline is expected to come into service at the end of 2019. The pipeline is set to run from the Russian coast along the Baltic Sea bed to the German shore. Each of the pipeline’s two stretches will have a capacity of 27.5 billion cubic meters. The new pipeline will double the capacity of the first stretch and will basically follow its route. Capital expenditures on the project are estimated at 8 billion euros and its total cost will amount to 9.9 billion euros, taking into account project financing.